5 piece matryoshka doll set is made in the traditional style. This set is made by hand in Rus..
Matryoshka nesting doll Beauty4. Free worldwide shipping. 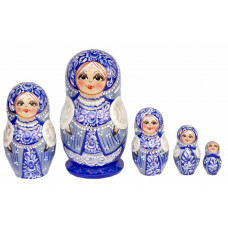 5 piece matryoshka doll set is made in Gzhel style depicting blue flowers. This set is m..
Matryoshka nesting doll Gzhel Dolls. Free worldwide shipping. 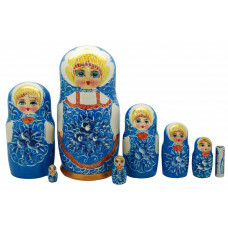 7 piece matryoshka doll set is made in Gzhel style depicting blue flowers. This set is made by ha..
Matryoshka nesting doll Gzhel dolls6. Free worldwide shipping. 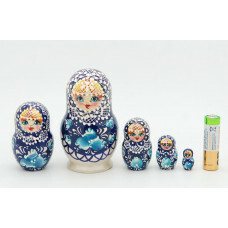 5 piece matryoshka doll set is made in Gzhel style depicting white and blue flowers. This set..
Matryoshka nesting doll Gzhel12. Free worldwide shipping. Matryoshka nesting doll Gzhel16. Free worldwide shipping. 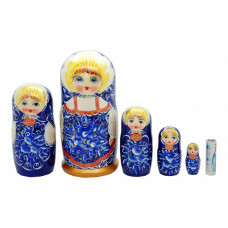 5 piece matryoshka doll set is made in Gzhel style depicting blue flowers. This set is made by hand ..
Matryoshka nesting doll Bride1. Free worldwide shipping. 5 piece matryoshka doll set in traditional Russian style with samovar. This set is made by hand in R..
Matryoshka nesting doll Traditional with samovar. Free worldwide shipping.